This is just a bit of fun attempting to graphically represent the concentration of CO2 in the atmosphere at 400 ppmv. The area of the square is set to 1. The problem becomes how to show an invisible molecule with a length of about 3 Angstroms. 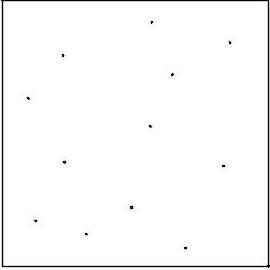 The choices range from putting a single dot with an area of .0004 to a hundred dots at .000004. The latter option results in dots that are barely visible. A case can be made for the single dot. You could actually render a single realistic CO2 at this scale. Maybe another day. Anyway, this exercise represents three dimensions in only two and having more dots seems more satisfying today. It calculated as 11.11 dots at this size. I put in 12. What a generous guy, no? Changed my mind and did it today.